When it comes to superheroes, one of the most popular movie characters is Batman, and LEGO has created a wonderful set to showcase the battle between Batman and Man Bat! 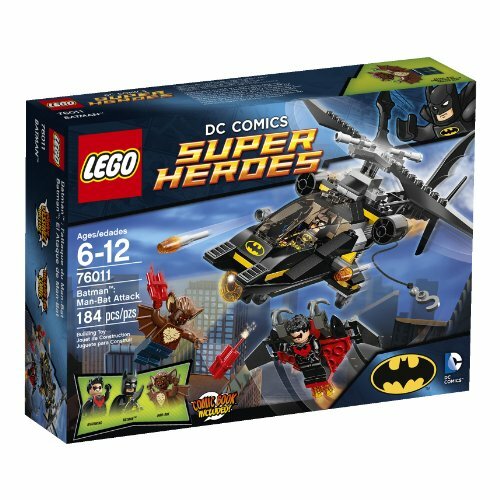 The LEGO set comes with both Batman and Man Bat, along with Nightwing. There is an assortment of weapons, including a Batarang and a couple of sticks of dynamite for them to use in the battle between good and evil. Nightwing has the glider to use, with grapples. The Batcopter is fully equipped with rotors that spin, a couple of flick missiles and a winch and hook for hoisting things. The cockpit actually opens up in the Batcopter, too. The copter measures at three inches high, 11 inches long and three inches wide. The Nightwing’s glider is two inches long and three inches wide. Your child will enjoy watching Nightwing keep watch over the city of Gotham. When he sees Man Bat setting up some dynamite for an attack, he can call on Batman to help him as the two use their glider and Batcopter to thwart Man Bat’s plans. LEGO fans consider the LEGO Superheroes Batman Man Bat Attack to be one of the best Superheros sets in the line. The set is small in terms of pieces. It only has 184 LEGOs to use to create the set. It shouldn’t take more than half an hour to put them together, but they’re so much fun once it’s all complete! Whether it’s for your kids, or you (as a collector, of course), this set will bring the battle of good versus evil to life. Make sure if you’re building this for your child that he or she understands that this isn’t a sturdy kid’s toy. The Batcopter will break apart if your child decides to make it have a hard crash landing. Nightwing is sure to be a favorite in this LEGO set. He used to be Batman’s sidekick, but he grew up and went out on his own to be another superhero. Many LEGO collectors look for the specific figures they’ll get whenever they pick up a set, and this one is unusual and coveted. You can pick up more of the LEGO Superheroes line, and invest in more Batman sets in particular. But this one is one that every kid who loves a good air fight will love to have in his or her LEGO toy box!